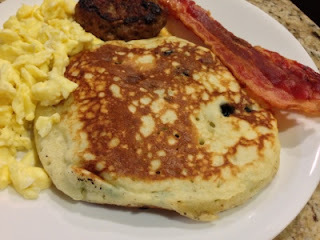 Hubby LOVES fluffy pancakes. The fluffier, the better. He even loves them more than waffles. What a weirdo, right? If using frozen blueberries, take the blueberries out of the freezer and let it sit while you get everything together. It'll give it time to thaw a bit. Combine milk with vinegar in a small bowl or a measuring cup and set aside to "sour" while you get the rest of the ingredients together. In a large mixing bowl, combine flour, sugar, baking soda, baking powder and salt. Mix well. Pour in "sour" milk, melted butter, vanilla and egg. Whisk until lumps are gone. Heat a large frying pan over medium heat, and coat with 1 tsp of extra virgin olive oil. Pour 1/4 of batter onto the pan, and drop 2 Tbsp of blueberries into the pancake. Cook until bubbles appear on the surface. Flip with a spatula, and cook until browned on the other side. Continue this with the other 3 pancakes.